A radical new health care proposal that, if implemented, would ban private insurance coverage has garnered the endorsement of more than 100 members of the House Democratic conference—nearly half of Speaker Nancy Pelosi's (Calif.) 235-seat majority. 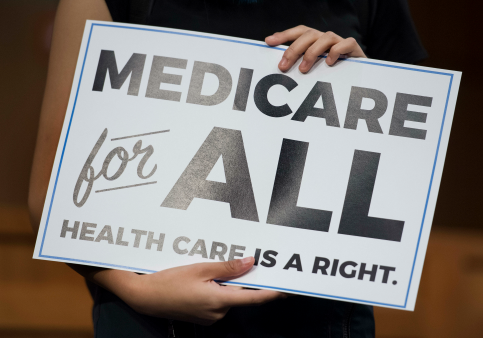 Last week, Democratic congresswoman Pramila Jayapal (Wash.), the co-chair of the Congressional Progressive Caucus (CPC), introduced the Medicare-for-All Act of 2019. Billed as a means to provide "freedom of choice" to health care consumers, the legislation would require everyone, regardless of existing insurance coverage, to enroll in Medicare within two years of passage. Under the proposal, "all primary care, hospital, and outpatient" services would be covered by Medicare without any co-pay or out-of-pocket costs. Encompassed among the list of covered procedures are abortion, mental health and substance abuse treatment, and transportation to and from "health care" appointments for low-income individuals and those with disabilities. The proposal's most controversial aspect, however, entails the phasing out of private insurance plans. The bill would make it illegal for private insurance providers to sell health coverage that "duplicates the benefits" offered by the taxpayer-funded Medicare-for-All program. Likewise, the bill prohibits employers from offering coverage to their employees if it mirrors those offered by the federal government. Private health insurance plans could only be sold to individuals or offered by employers if they "provide supplemental coverage" on top of Medicare-for-All. Other provisions in the bill limit the federal government from subsidizing any private insurance plans. Despite polling showing that more than 80 percent of voters oppose eliminating private insurance plans, Jayapal's bill garnered the backing of 105 other House Democrats upon introduction. The support, although stemming largely from CPC stalwarts and liberal firebrands like Rashida Tlaib (Mich.), Alexandria Ocasio-Cortez (N.Y.), and Ilhan Omar (Minn.), also came from several moderate and freshman Democrats. Some freshman Democrats, like Jared Golden (Maine), Katie Hill (Calif.), Susan Wild (Pa.), and Mike Levin (Calif.) signed as cosponsors of the bill after making it an issue during their 2018 congressional races. Each campaigned as bipartisan pragmatists and won their districts narrowly by promising to fix Washington, D.C. Moderate Democrats like Ann Kirkpatrick (Ariz.), who was elected to the House in 2018 after a two-year absence, also backed the legislation even though she opposed the idea while campaigning, based on its fiscal implications. Kirkpatrick's office did not return requests for comment on this story. It is unclear what impact eliminating private health insurance plans will have on the 2020 campaign. Apart from banning private insurance plans, Jayapal's Medicare-for-All legislation is likely to be contentious because of its social and fiscal components. Tucked away in the 119-page bill is language requiring Medicare to cover abortion service by repealing the Hyde Amendment, which prohibits federal funds from being used for such a practice. There are also outstanding questions concerning illegal immigrants and if they would be eligible to receive coverage under the plan. The legislation "requires" the secretary of health and human services to establish a "mechanism for automatic enrollment at birth, time of immigration into the U.S., or acquisition of qualified resident status." Jayapal, who proclaimed "health care a human right" in the initial rollout of her bill, has refrained from elaborating on how much the plan would cost or how it would be funded. Previous estimates for the Medicare-for-All bill championed by Sen. Bernie Sanders (D., Vt.), which is acknowledged to be less comprehensive than Jayapal's proposal, put the price tag at upwards of $32 trillion. This entry was posted in Politics and tagged 2020 Election, Congress, Democratic Party, Health Care, House Democrats, Medicare, Progressive Movement. Bookmark the permalink.